I know, it’s been awhile since I posted. I’ve been busy! 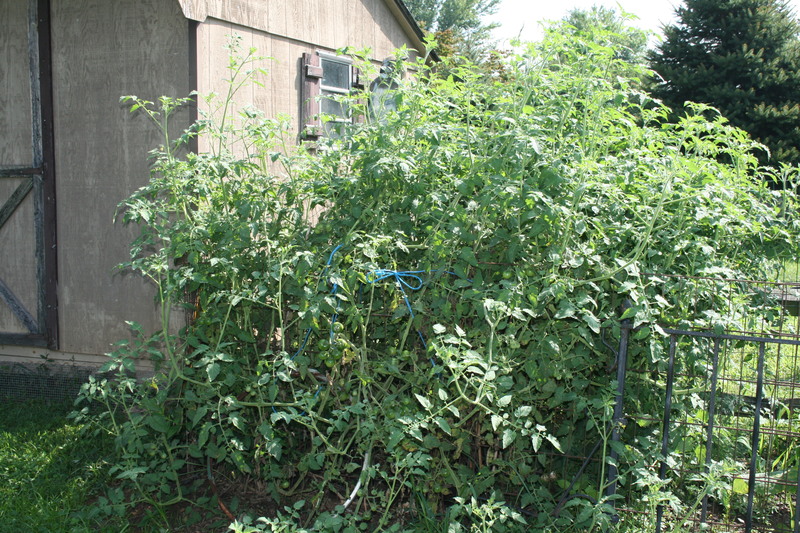 My garden is looking a bit ratty, especially the tomatoes. Because of all the rain we have had, you can see that almost every plant has Septoria. 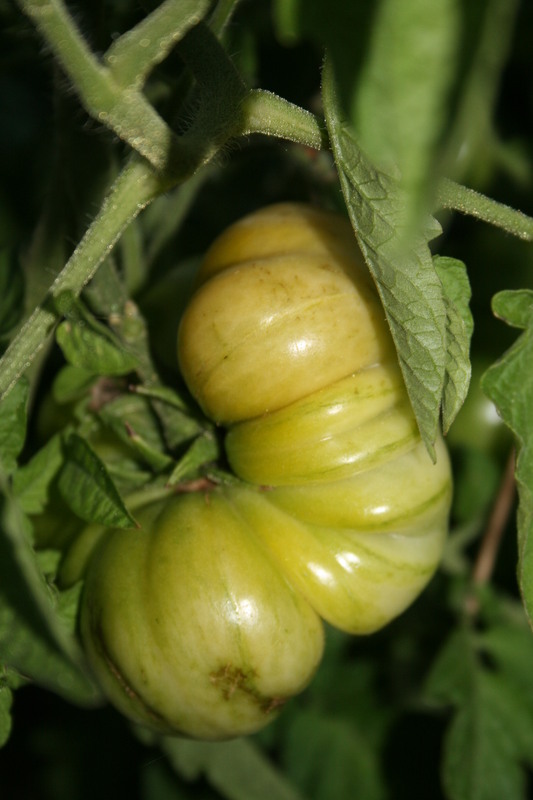 The yellow-ringed brown spots cover many of the leaves and the ones farthest gone have turned brown and died. Despite the bout with disease, the absolutely drenching rains and the wonky temperatures, as you can see, these plants continue to produce. 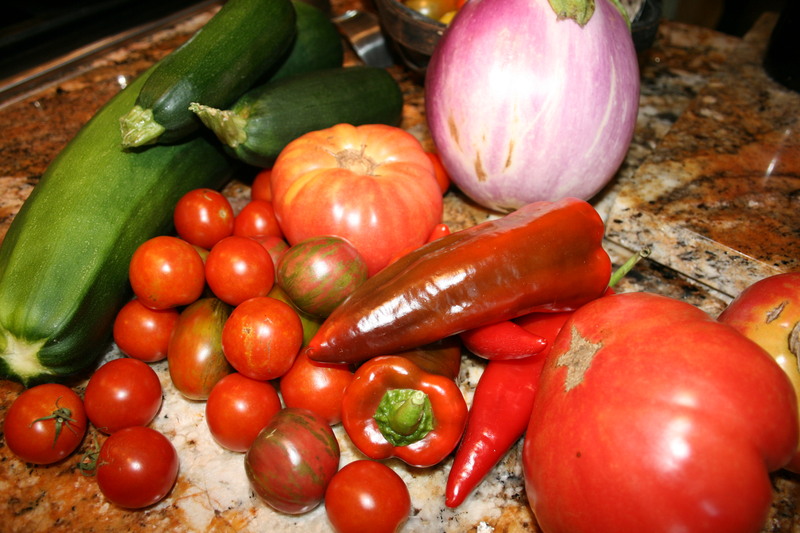 I am getting 2 to 3 quarts of Fox Cherry, Atomic grape and Genovese tomatoes every 2 or 3 days! And I have a volunteer Fox Cherry that decided to plant itself in my compost bin and this baby is producing fruit that is just now starting to ripen. 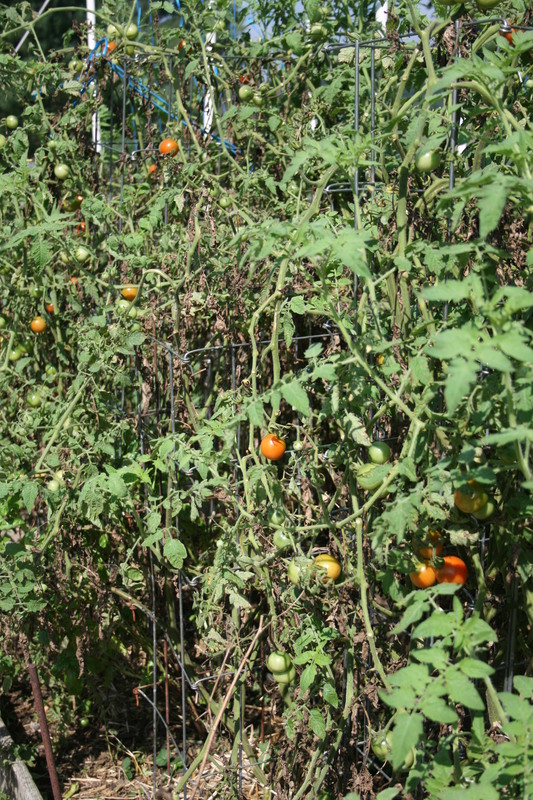 Oh my, more tomatoes! 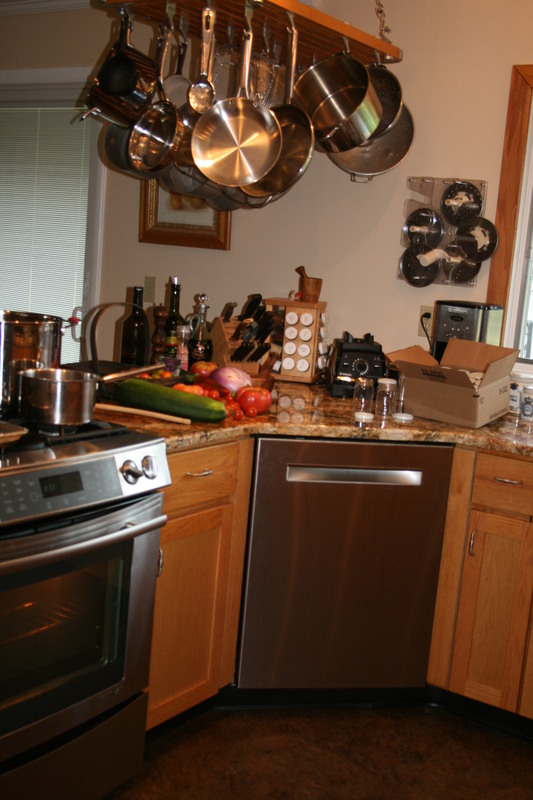 I’ve already made sauce, salsa, scallopine and paste! Volunteer Fox Cherry is huge! Today, in self defense, I am making ketchup. This is a first for me but I am LOVING what I see and smell. There are a lot of recipes online for homemade ketchup but the one I liked best was by Pioneer Woman. This recipe has the least amount of sugar and the subtlest spicing done with fresh onions and garlic, also from my garden. 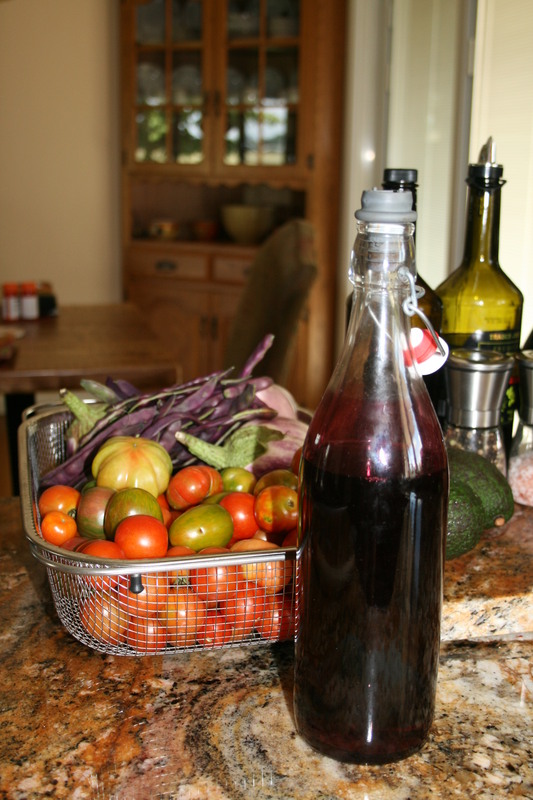 And I got to use some of the wine vinegar I made and bottled last year. The color, flavor and taste of this vinegar is superb — a full mouth feel and soft wine finish. 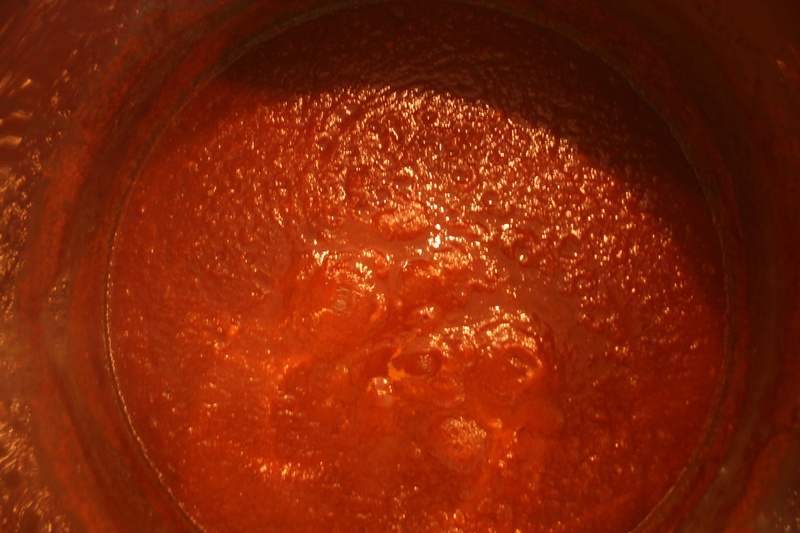 The recipe for this amazing and rich tasting ketchup is below! Blueberry, blackberry and cherry jams are lined up on my pantry shelf. Blackberry and cherry brandy are aging in gallon jugs. 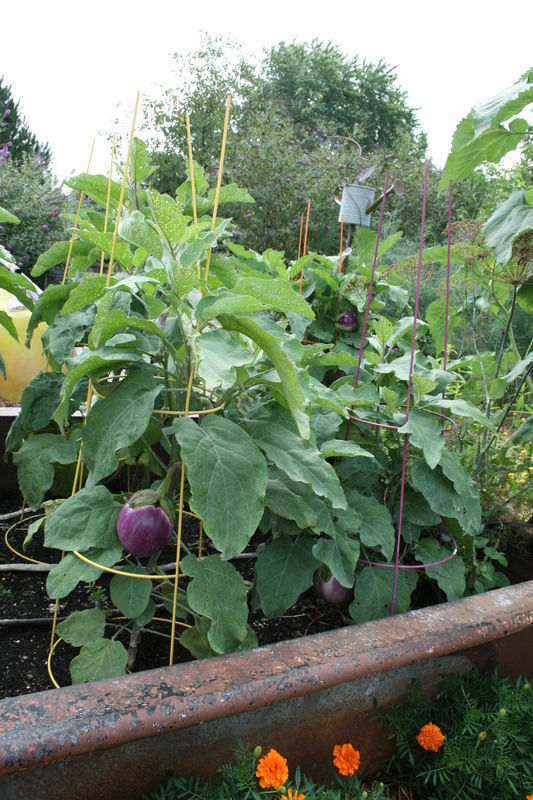 And I’ve put up eggplant, green beans, made salsa, scallopine, tomato sauce and tomato paste! 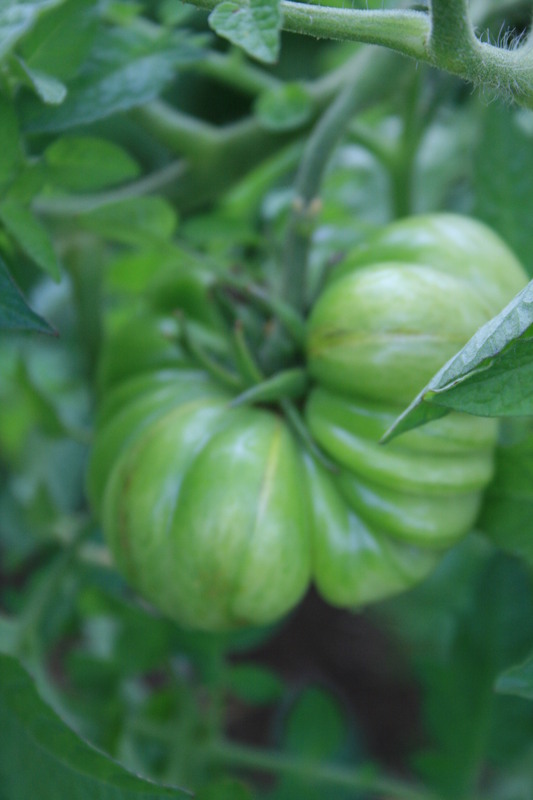 So this has been a very good year for my garden. 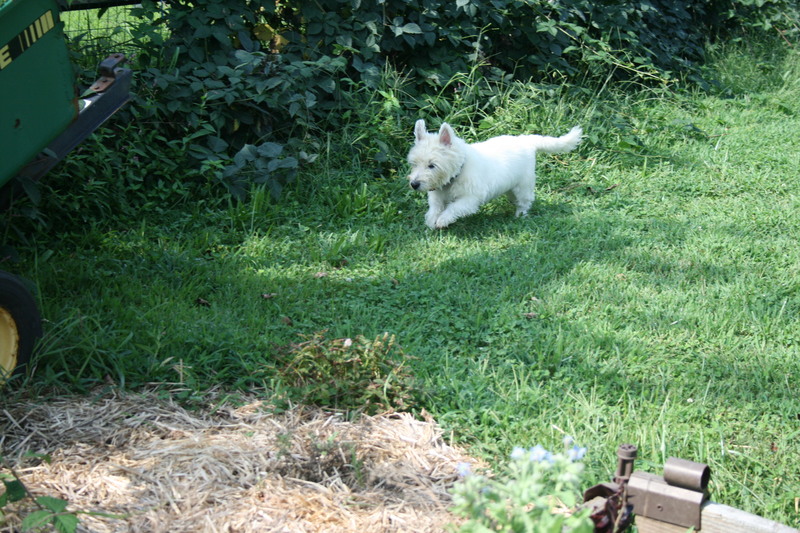 And for my volunteers…who include this new rescue Westie, Linus! Linus joined our family a short 8 weeks ago after the tragic death of one of our Westies, Spike. He has settled in and is really loving the back yard! One last thing to share. This is a bite I sustained last Tuesday. It is most likely that of a brown recluse spider. The pain was immediate and immense. Almost simultaneously, my arm stared to itch. There was a single strike mark which raised into a 1/4 inch high blister surrounded by a 2 inch square of rapidly rising smaller blisters. I did not consult a physician but did use my family’s tried and true remedy for all bites – a baking soda paste, applied immediately to the wound. The pain and the itching were completely controlled but this bite mark is persisting and will probably leave a scar, maybe in the shape of a heart! So, in this very wet summer, please make sure you keep your eyes open, be careful and enjoy the fruits of all of your labors. NOTE: if making large batch of ketchup, simply determine total ounces of tomatoes and increase all other ingredients, accordingly. Process tomatoes using the Vittorio juicer to remove seeds and skins. 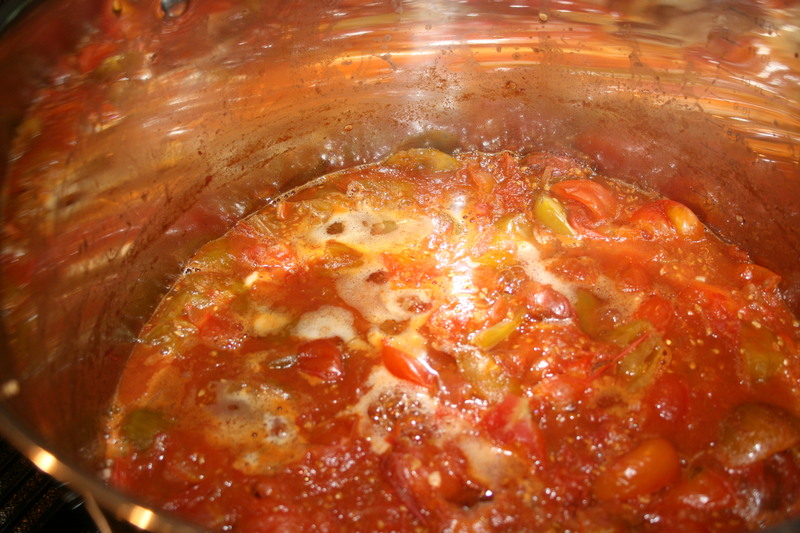 Put tomatoes in large, non-reactive sauce pot and cook overnight on very low flame to reduce and boil off water. Heat a large, non-reactive frying pan over medium heat. Add olive oil and onions, sauté until translucent, about 8 minutes. Add garlic and sauté until fragrant, about 2 minutes. 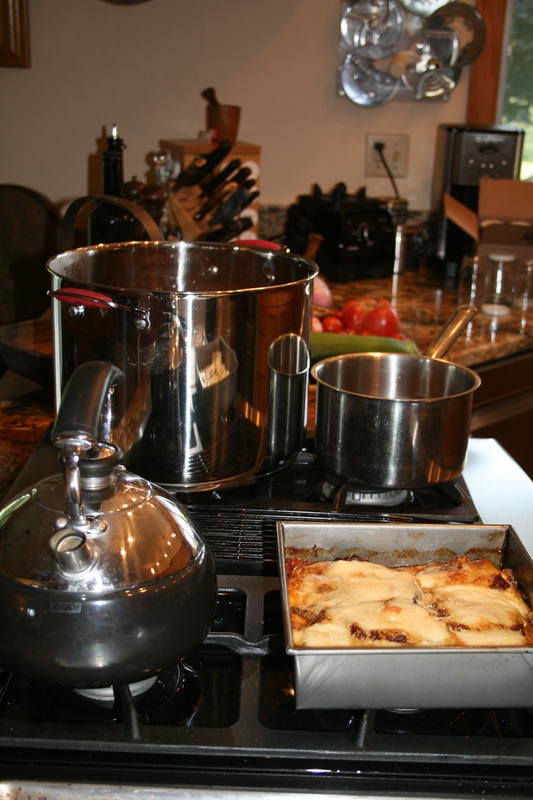 Add sugar, molasses and vinegar to the onion mixture and bring to a slow boil, lower to a simmer and cook for 10 to 12 minutes while the sauce reduces and thiikens slightly..
Add the onion mixture to the tomatoes and continue to simmer, uncovered overnight until very thick. 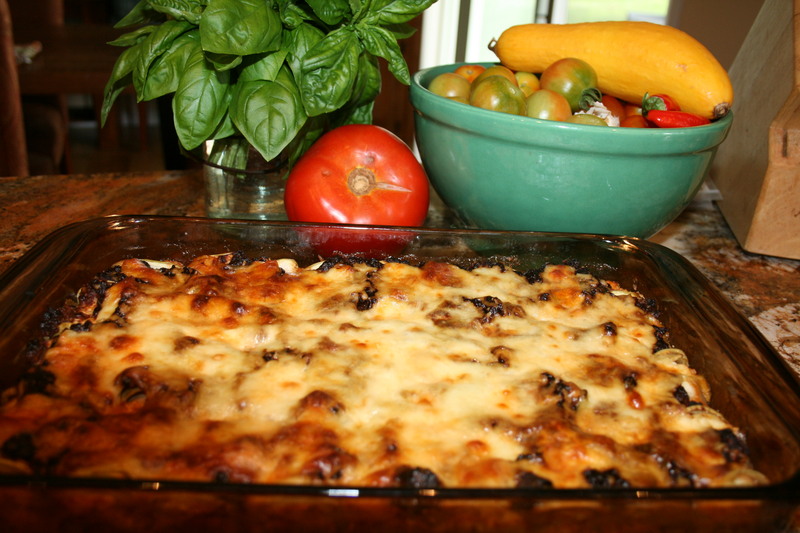 NOTE: Because there is added sugar in this recipe, make sure to keep an eye on it and stir it to keep it from scorching. 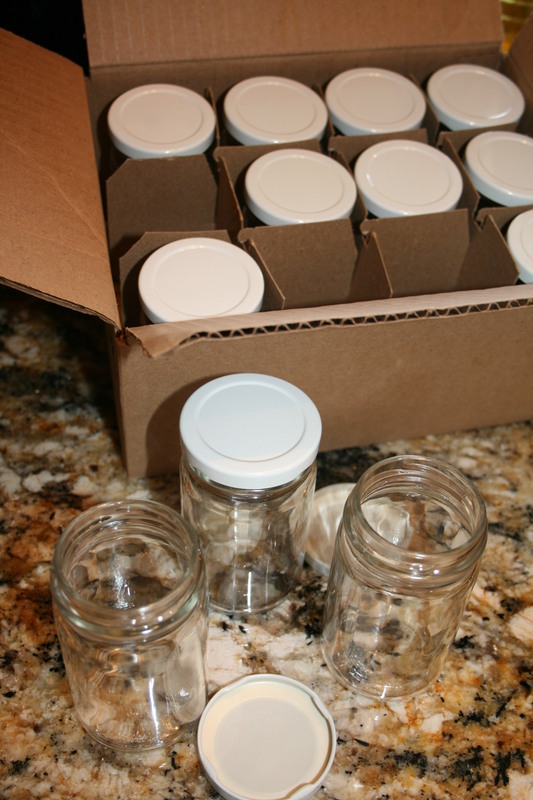 Jar and, depending on jar size (pints or quarts) water bath appropriately. Cool, label and store. How To Plant Asparagus, Again! My husband and I got good news last Thursday, really good news. His most recent PET scan was clear! We did a little jig then sat down and tried to let it sink in a bit. 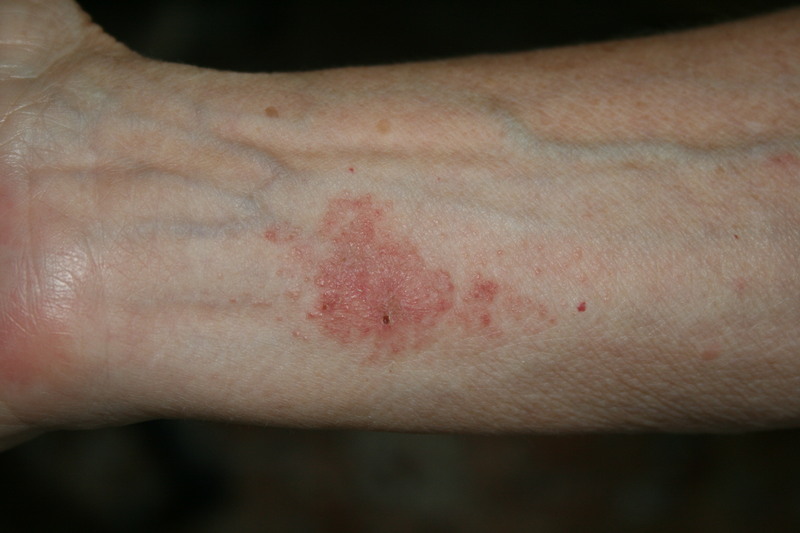 No new melanoma! No metastases. So, what does this have to do with planting asparagus? Everything! 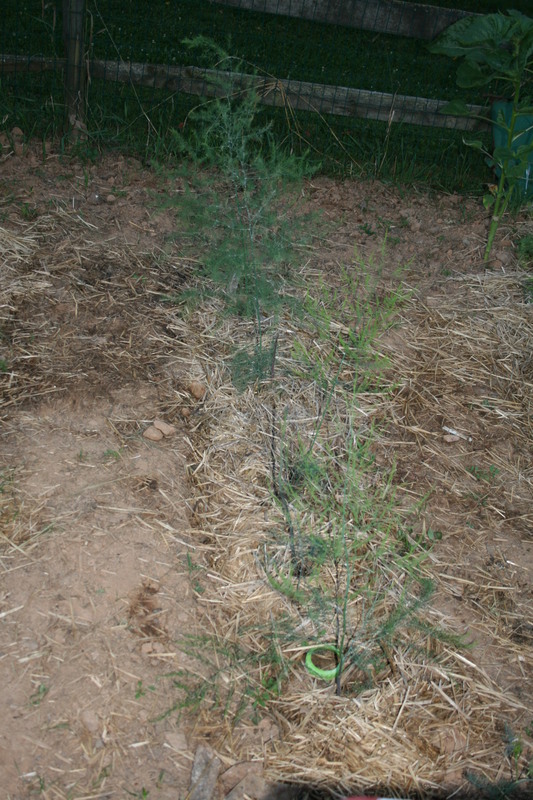 My current asparagus bed is close to 25 years old. To say it’s slowed down is a bit of an understatement. 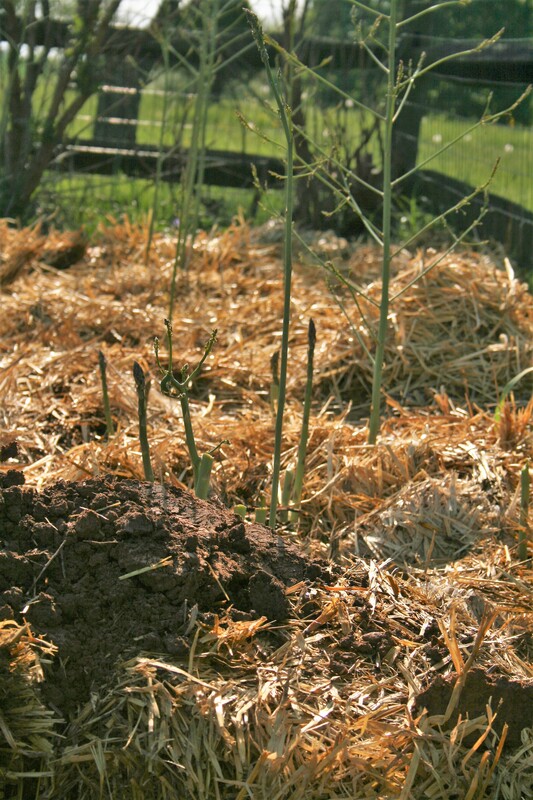 The bed is actually a bit glacial when it comes to putting up tasty green spears of asparagus. I needed a new bed but I was afraid to plant new crowns…in case the diagnosis for my husband was not a good one. Asparagus is one perennial that, once planted, keeps on giving. I just wasn’t sure we would be here to enjoy it. So, my celebration last Thursday culminated in me ordering 20 new, Jersey Knight male asparagus crowns! I ordered 1 year old crowns as they are usually a bit “healthier” than 2 year old crowns — meaning they will grow a bit more vigorously in their first few years and be less prone to rotting. I think I’d actually forgotten what it meant to “plant” asparagus. Okay, you only have to do it once to reap the rewards..but doing entails some pretty hard work especially at my ripe old age of 70! The crowns are on their way so, this morning, just 3 days after ordering, I was in the garden, digging. I picked a spot that gets almost continuous sunshine all day long. That’s just what asparagus likes. Asparagus crowns need to be planted in trenches. 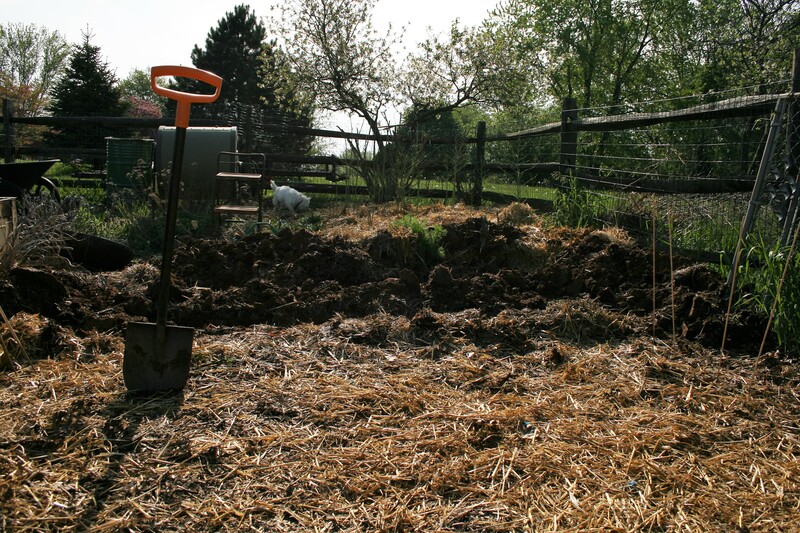 My soil is a bit on heavy side so I only had to dig down 6 inches…and the trenches should be 12 inches wide. I cheated a bit on the width but I got the length I needed in each trench to be able to put 4 crowns in each one. If you’re doing the math, you might notice that I only have 4 trenches dug. I will probably need the 5th trench but I just can’t face it, right now. Tomorrow is another day. In fact, tomorrow, I will dig the other trench but I need to prep all 5 trenches to receive their new crowns. What’s the next step? I will need to add a dash of organic compost to each hole. When the new asparagus crowns arrive, I will also soak them in compost tea (compost and water) for about 30 minutes before I plant them. When I do put them in the trenches, I’ll make sure they are crown side up. Also, I’ll be careful to gently spread the crown out and give the roots room. Once in the trench, I won’t put all the soil back in the trench on top of the crowns. 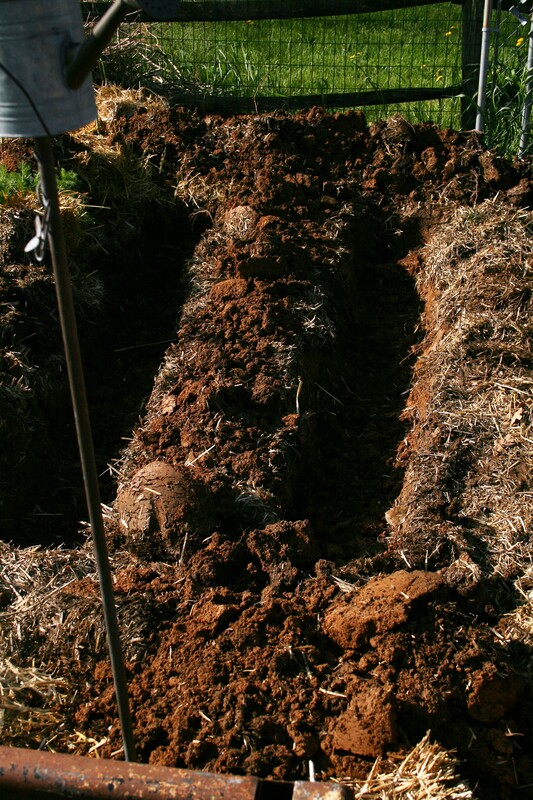 I’ll just add 2 to 3 inches of soil to the entire trench, gently tamping the soil down – NOT packing it. Once the crowns are set, I usually just water them in with my watering can, again, gently. Two weeks later, I’ll add 2 to 3 more inches of soil to the trench. Then I’ll keep watch on the bed and add more soil to the trench until it is slightly raised. Then, all you have to do is make sure you mulch the rows and water the new bed regularly during its first 2 years in the ground. A note of caution, don’t over water. 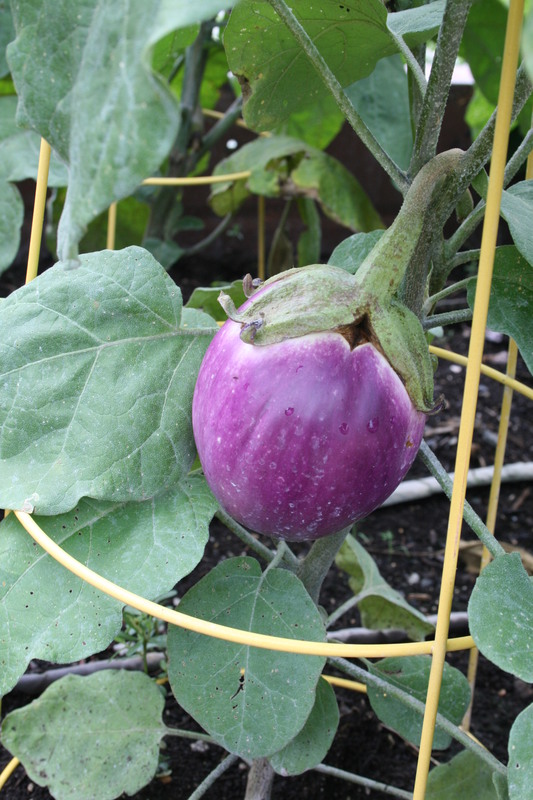 An accepted rule of thumb is water once a week unless it’s rained then you can skip watering. Do not harvest any asparagus the first year. 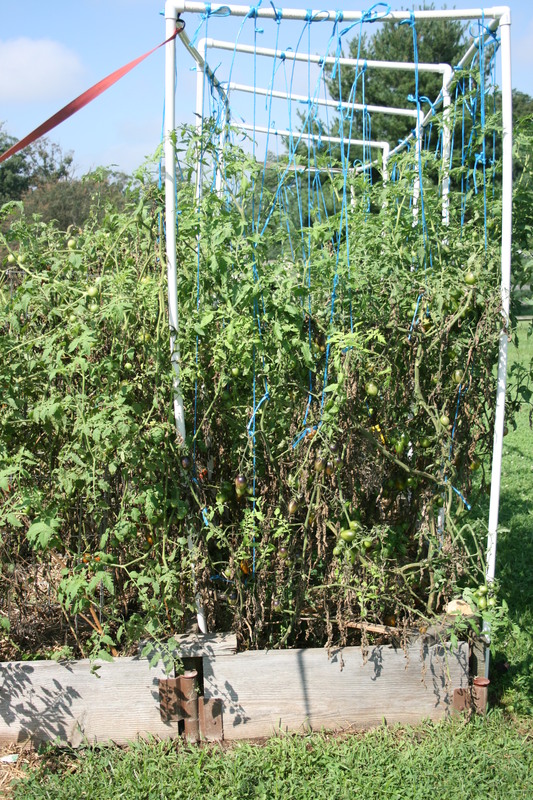 Harvest sparingly in the second year. The crowns need to put all their energy into sinking tap roots and growing their root structure. 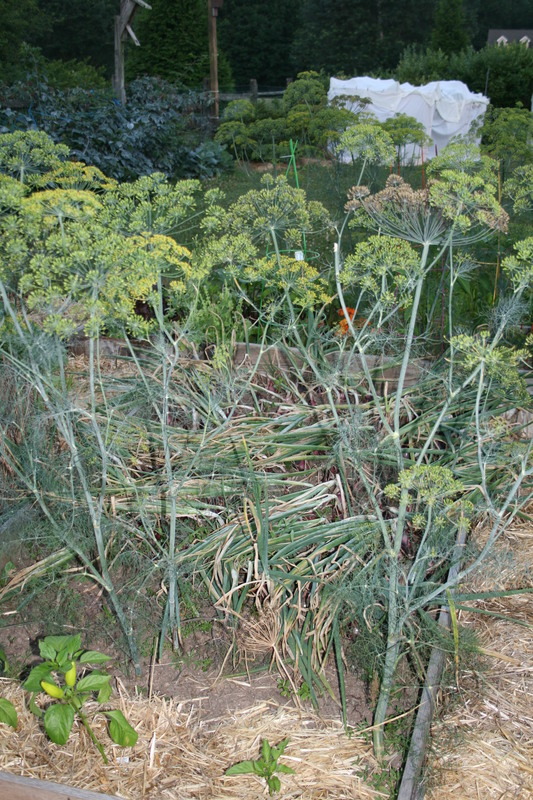 The third year, start cutting but make sure you leave enough for some stalks to fern and grow up. Leave the ferns over top of the bed, letting them die in place and not cutting them until the next Spring. 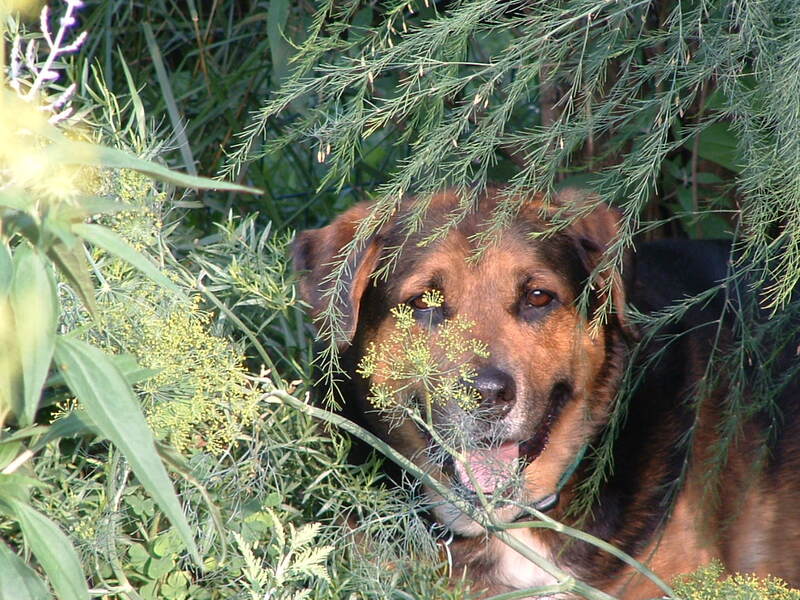 Dogs love to cool down under them and the dead ferns provide protection for the crowns during the winter. Once Spring arrives, cut down and remove the dead ferns. Then sit back and wait for beautiful, green, healthy and delicious asparagus! I got lucky when I married Italian because garlic is, was and always will be one of my favorite foods in the kitchen. And it’s one of my favorites to plant. Garlic is another crop that basically takes care of itself. 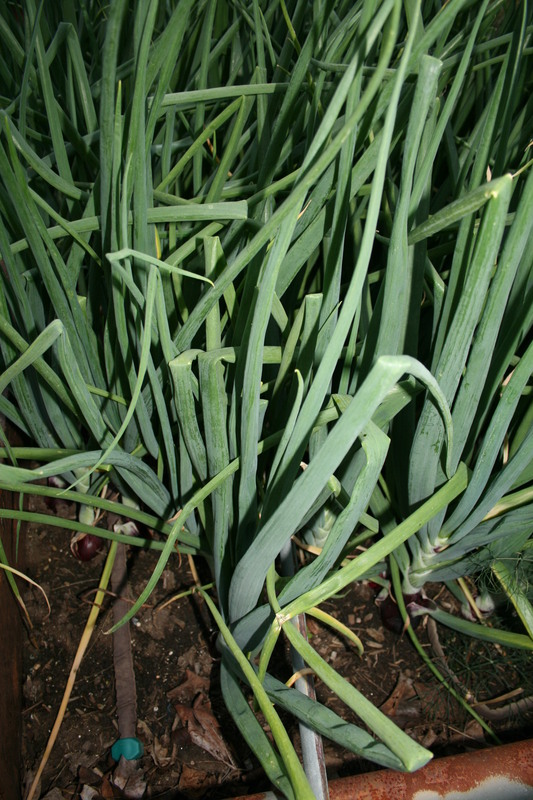 If you get the right cloves to plant then give those cloves a good start in the right soil at the right time, you should harvest enough nice-sized bulbs of garlic to last through the year. 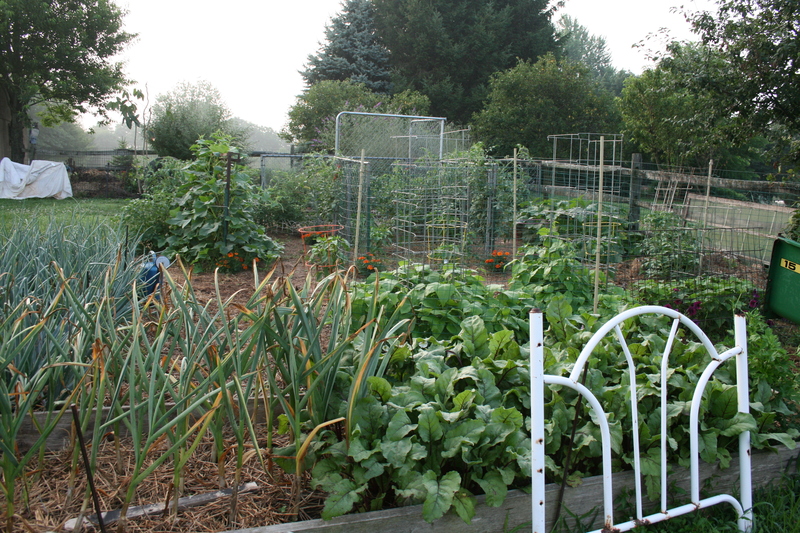 Garlic is planted in the fall. If you didn’t put your garlic seed (cloves actually) in the ground in October, it’s too late to plant it now. 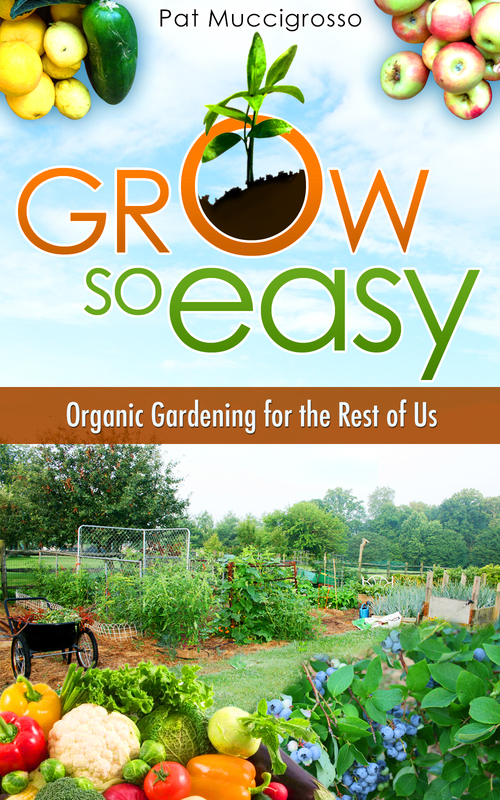 If you plant in the Spring, you are doomed to fail. Seed garlic is dormant. It MUST be exposed to cold temperatures in order to grow and change from cloves to bulbs. 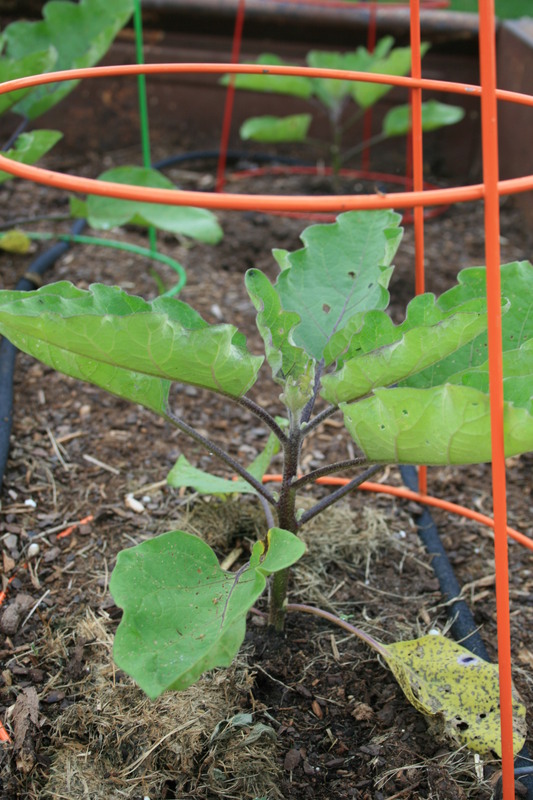 No cold means no bulbs, spindly growth and frustrated gardeners. 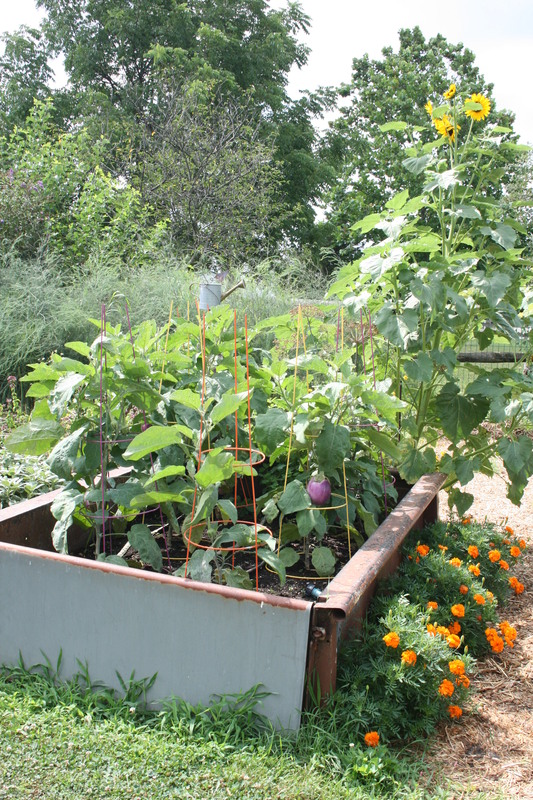 Besides, planting in the fall means that Mother Nature gets to do all the work while you sit inside browsing through seed catalogs and dreaming of spring. 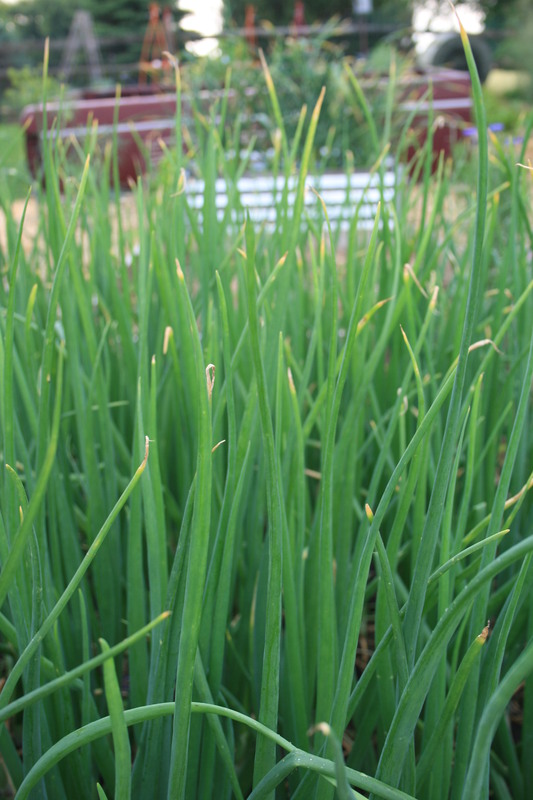 If you planted your cloves in the fall, you should already have healthy, happy garlic babies growing in the soil. Planting when the world is getting frosty, the snow is falling and the wind is cold seems wrong and it would be if that’s all you did. 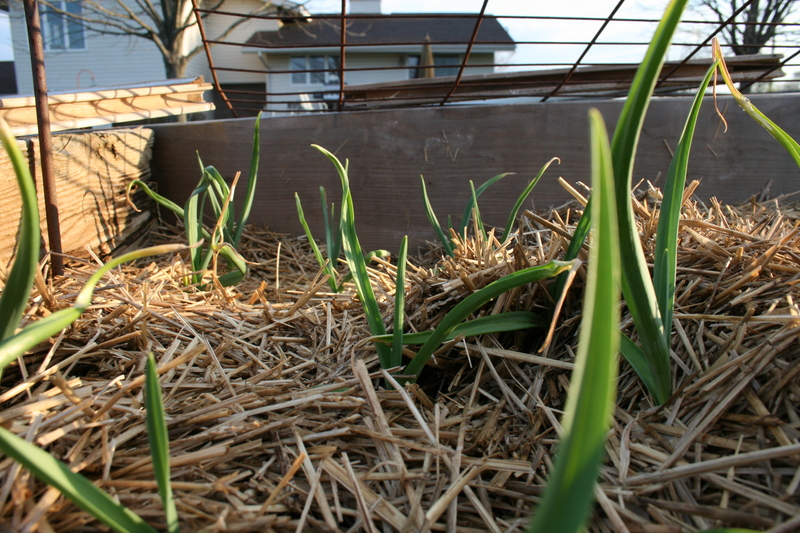 But there’s an easy, cheap trick to keeping your garlic safe through the blustery winter months; you blanket them in straw. 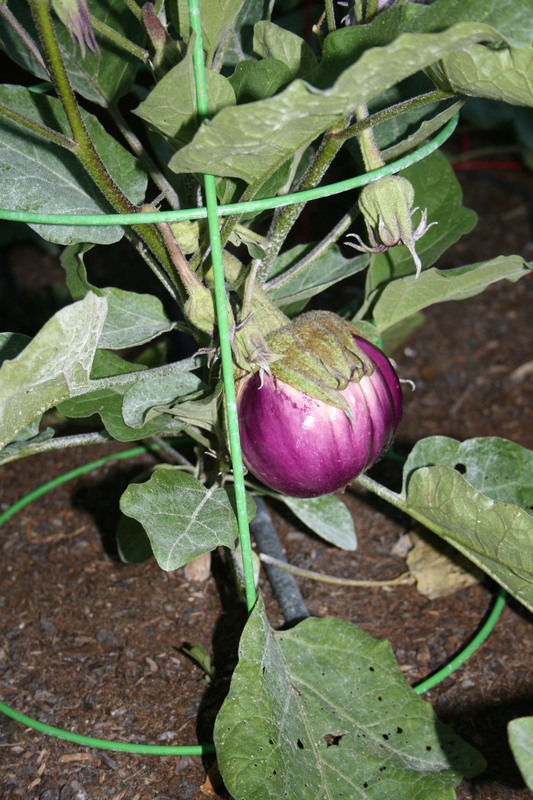 The straw protects the bulbs from the cold, lets them overwinter safely and ensures they will be ready to start growing as early as March. Once Spring arrives, it’s important to uncover the garlic as soon as possible so the sprouts don’t rot. 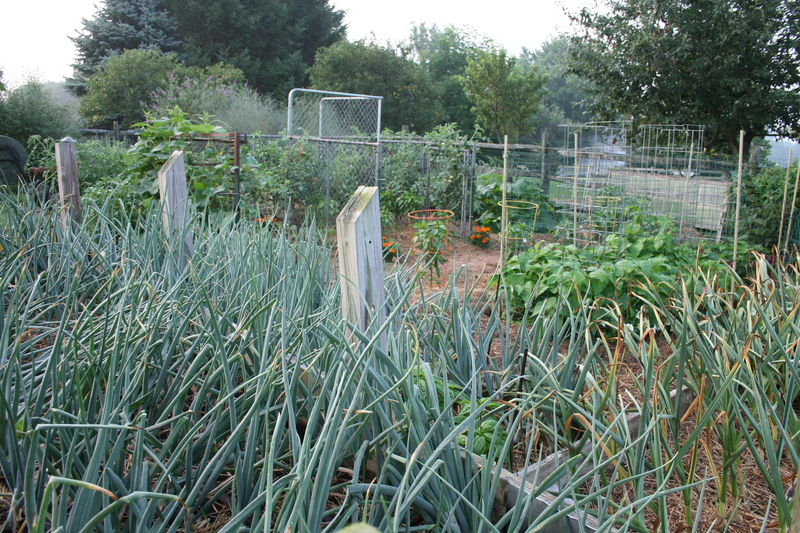 If they rot, you will lose your garlic crop. Here’s an easy tip for knowing when to uncover garlic (and onions). When the forsythia bloom, pull back the mulch. 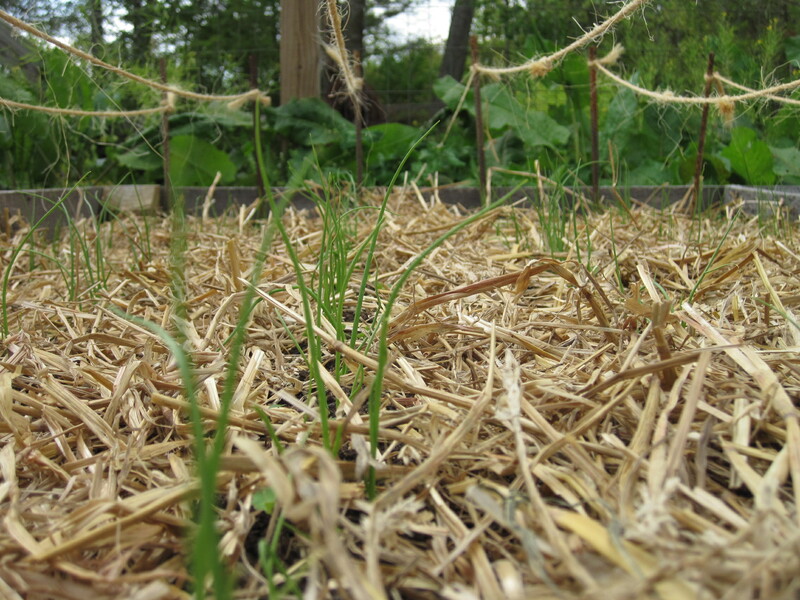 You may even find a few garlic bulbs already sprouted under there. 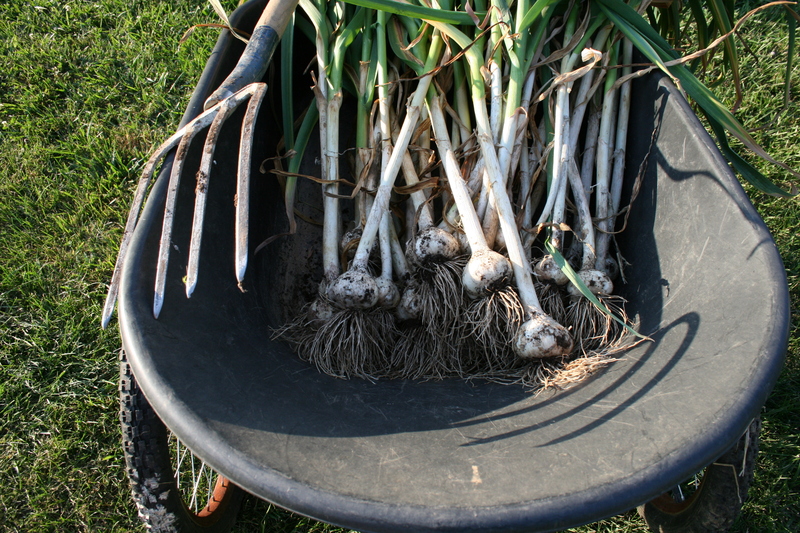 Depending on your zone, you will probably get a few frosts after you uncover the garlic. 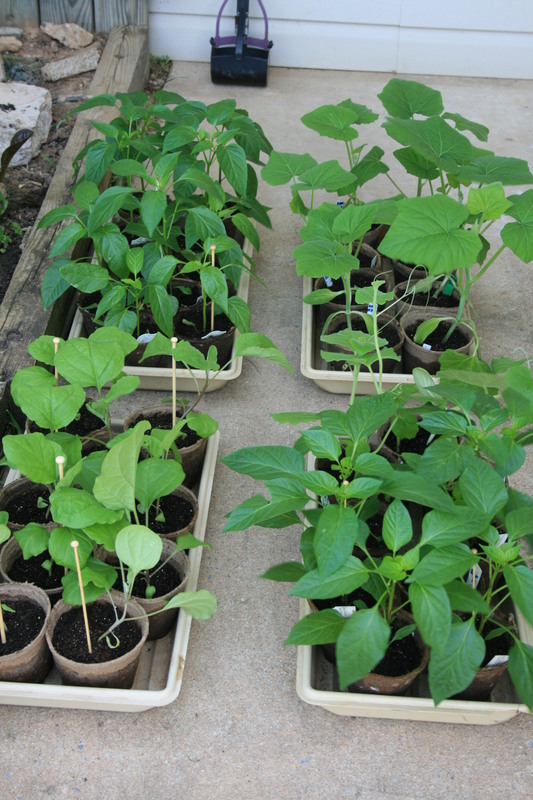 Just toss something over the young plants to protect them. 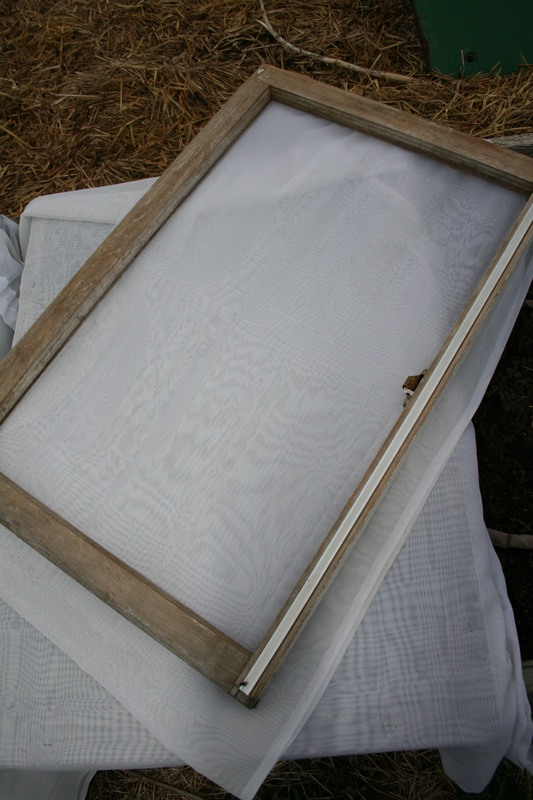 I use window frames that I’ve stapled old curtains to or an old queen-sized mattress cover and drape it over the corners of the bed where the garlic is planted. How do you know when to pull the garlic up? Honestly, this has always been a struggle for me. And the more I researched and read, the more confused I got. Pull it up on this day/date. When the leaves on one or two start to brown, push the rest of them over, wait a week and pull them up. Wait until all the leaves on the plants are brown then pull them up. Aaaaaaargh…as one our most famous philosophers used to say!